Michael Ziobrowski of Santa Ana has just been commissioned to custom-paint drums for Questlove, world-renowned drummer of The Roots. The five-piece kit was taped up and sprayed in pastel palette. “I’ve always been a music person, in some form or fashion, whether it was making beats, DJing, collecting…I love music, it inspires me. 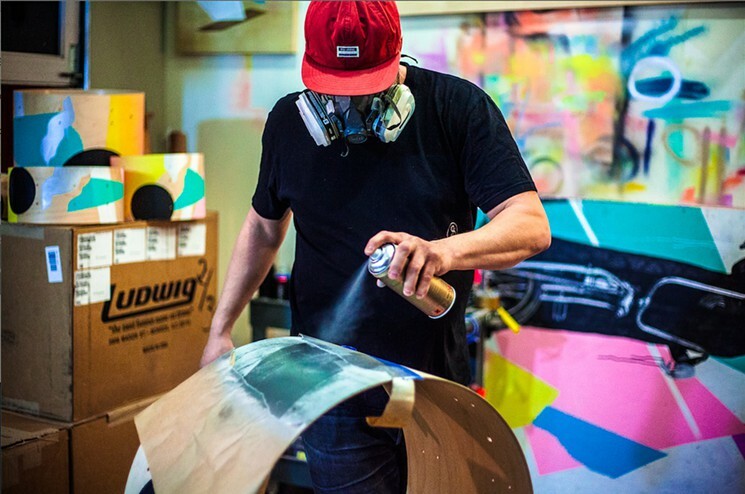 So to be able to do art and connect it to music—it’s amazing!” While painting the kits, he would listen to Questlove’s NPR interview with Terry Gross and various Roots records. He even went out and bought Questlove’s New York Times best selling memoir Mo’ Meta Blues: The World According to Questlove.